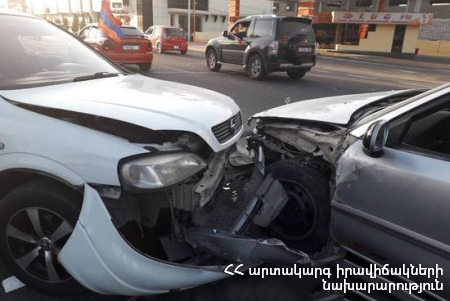 On February 9, at 19:57 an emergency call was received to “911” service that a car accident had occurred near the bridge on Arteni-Aragatsavan roadway: there were casualties, the rescuers’ help was needed. It turned out that “VAZ-2109” and “Opel” cars had collided on the 1st km of Arteni-Aragatsavan roadway. Before the rescuers arrived at the scene the driver and passenger of “VAZ-2109” car had been taken to the medical centers of Talin and Armavir towns. According to doctors the casualties were in serious condition. The ambulance workers rendered necessary medical aid to the driver of “Opel” car: there was no need for hospitalization.